As you probably know by now, I’m a Graham and Brown Ambassador and as such I’m covering their year of trends here on the blog. With one trend per month we’ve already looked at Precious, Popsicle, and Northern Rose. This month I’m interpreting a trend called Eureka. What does that mean? Well, it’s about creating the wow factor, that focal point, that part of the room that takes your breath away. It’s not easy to create but with a little thought and creativity it can be done. 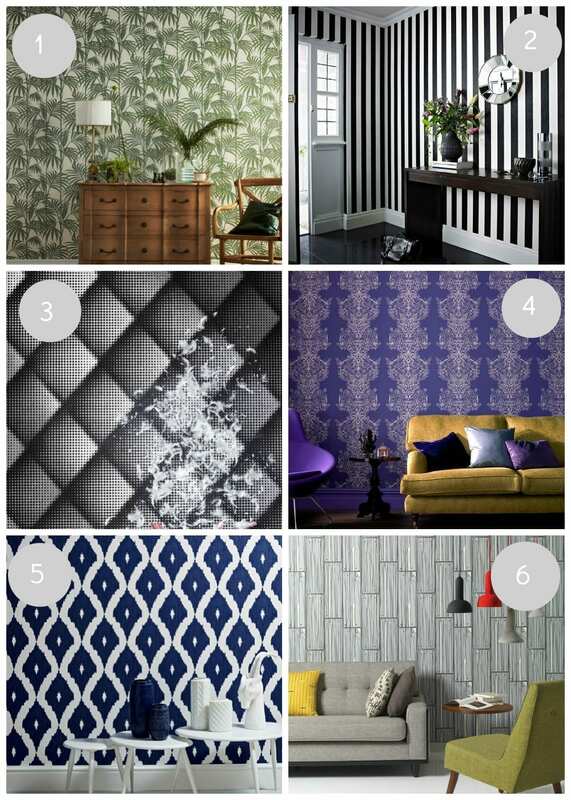 In the hope of helping someone create that Eureka moment with wallpaper in their own home, I’ve selected some of my favourites from Graham and Brown that really stand out. 1. Palm Prints are still everywhere and I think they’re going to be around for a little longer yet. This one by Julien McDonald makes a bold statement in any room and looks particularly good in a downstairs living space. 2. Another dramatic design by Julien McDonald for Graham and Brown certainly makes an impact in a monochrome scheme. Paired with glossy, or reflective pieces this one looks stunning. 3. Braille Chester Noir, another designer addition, is certainly eye-catching, and quite seductive. 4. Beautiful ink blue papers and colour schemes are going strong into the A/W 15 collections, and will look incredible teamed with other blue hues, or contrasting yellows and oranges. 5. This Ikat print by Kelly Hoppen is very popular, and if the blue is too much for you, it’s available in a softer, yet still impressive grey tone. 6. Wood and natural texture papers are still featuring in next season’s ranges, so I had to include this one from Wayne Hemingway. I love the softer, paler print, which looks more contemporary than industrial. What do you think of these statement wallpapers? Would they create the Eureka moment in your home?